“Our soul waits for the Lord; He is our help and our shield. For our heart is glad in Him, because we trust in His Holy Name. Let your steadfast love, O LORD, be upon us even as we hope in You.” Psalm 33: 20-22. 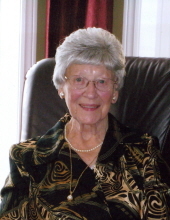 Early on April 13, the Lord called home his child Ann Bouwman in her 98th year. Ann was born in Appingedam, Groningen, the youngest of six siblings. In 1947 Ann and Derk were married in Appingedam and they immigrated to Canada in 1953 with two children, later adding two more. They were founding members of Ebenezer Canadian Reformed Church in Burlington, where they lived for many years. Mom’s love of gardening and flowers was always evident in her surroundings, even up to the last weeks of her life. Ann is survived by her children Jakob (Bonnie), Marion (Harry Terpstra), John (Margaret), and Wilma (Henk Venema). She was a dearly loved “Oma” to twelve grandchildren and thirty-six great grand-children. Ann spent the last eight years of her life in Shalom Manor, where she was lovingly cared for with respect and dignity. Friends may visit with the family at EBENEZER CANADIAN REFORMED CHURCH, 607 Dynes Road, Burlington on Monday, April 15th from 7-9 p.m. Graveside Service will be held at BURLINGTON MEMORIAL GARDENS, 3353 Guelph Line, Burlington on Tuesday, April 16th at 10 a.m. followed with a Memorial Service at EBENEZER CANADIAN REFORMED CHURCH starting at 11 a.m. Reception will follow the service in the Church. Please plan to arrive by 9:50 a.m.
"Email Address" would like to share the life celebration of Ann Bouwman. Click on the "link" to go to share a favorite memory or leave a condolence message for the family.